Philip Meyer took a series of photographs showing residents of the Blue River Valley as they prepared to move from their homes and farms as part of the Tuttle Creek reservoir and dam relocation project. 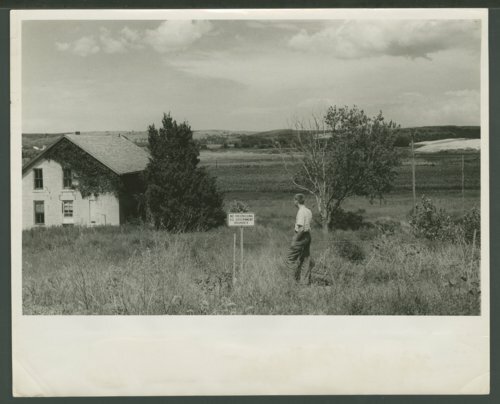 He captioned this photograph: "Dr. Burkman visited the deserted home of a former acquaintance who lived near the dam site and was bought out by Army Engineers when construction started in 1952. The incompleted earth and rip-rap structure can be seen at right."